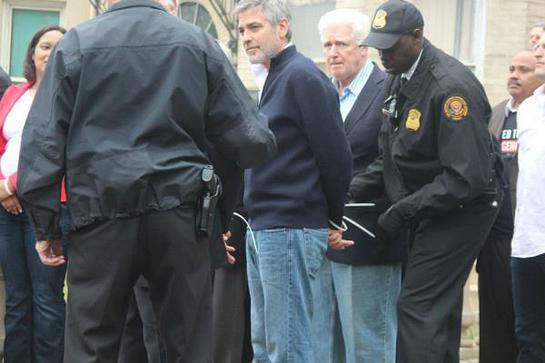 Actor and human rights activist George Clooney was arrested with his father and other protestors last week at the Sudanese embassy in Washington, DC. Not expecting to be arrested, they were demonstrating as part of a public awareness exercise about “Sudan’s weapons of mass starvation”. “We’re trying to bring attention to an ongoing emergency, one that’s got about a six-week time table before the rainy season starts and a lot of people are going to die from it,” Clooney said after his release. He was talking about the people of Sudan’s Nuba Mountains, just north of the border of newly separated South Sudan. Previously, Clooney had snuck into the restricted mountains with a camera crew to film what was happening, and says he witnessed hundreds of people running into the mountains for protection from a bomb attack, which he says is a daily occurrence there. “This isn’t a war of retaliation,” says Clooney. “This is simply trying to clear people out ethnically, because of the color of their skin.” The Nuba are Blacks, not Arabs. Back in the US testifying before the Senate Foreign Relations Committee a couple of days before his arrest, Clooney laid out a clear picture of what is happening in Sudan at the hands of the same three men, including Bashir, who orchestrated the atrocities in Darfur. 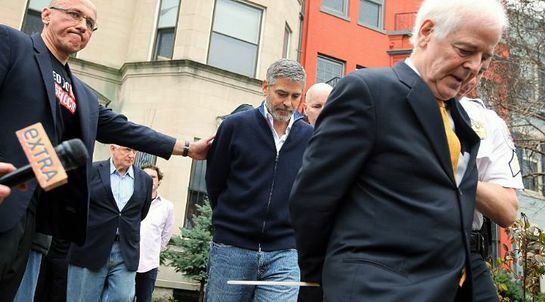 Clooney then outlined a course of action. When South Sudan shut down its oil production, which is refined in Sudan, China lost six percent of its oil imports and oil prices went up. With 20 billion dollars invested in oil infrastructure in the Sudan, China is now getting nothing in return.